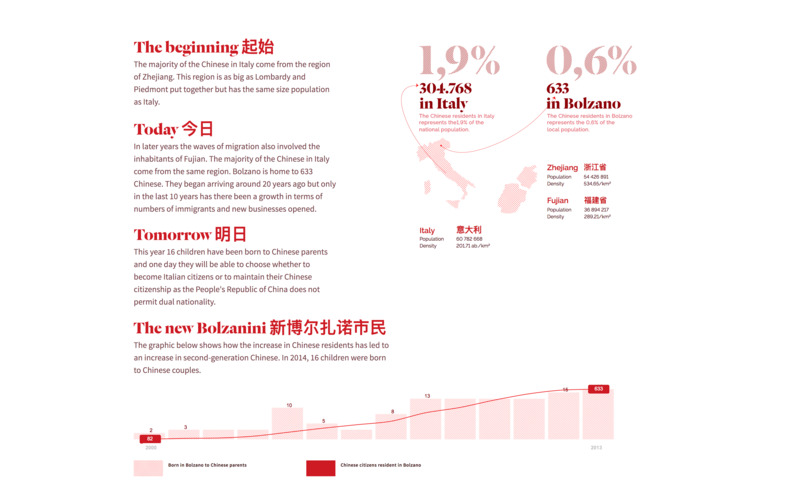 Combining a statistics-based investigation and a series of qualitative interviews, the People's Republic of Bolzano project aimed at inviting citizens to discover who the members of the Chinese community living and working in the city are, what they think of Italy, its local culture and society. Contrary to the common belief – propagated by local media - that Chinese people are “invading” the city, the project helped reveal that, while we have and are witnessing a small-scale migration of Chinese people to Bolzano, they are not creating a ghetto in the city. Rather, they are integrating within it. This project, is the result of a web based long-term journalistic enquiry. It features animated and interactive infographics, maps, and a series of qualitative interviews, which help reshape the identity of the local Chinese community through digital media, in order to contrast with the dominant and misleading narrative by the local media. Through a design project based on more transparent and balanced information, thereby allowing a broader audience to inform itself on such a complex and multifaceted issue, the project opened a local debate about the integration of the Chinese people in the city, that led the local media purveyor of the “invasion” theory to reverse its narrative. People’s Republic of Bolzano has awarded with the Data Journalism Award 2015 (best data visualisation of the year, small newsroom) and the European Design Award 2016 (Bronze, digital infographics). Researcher in Visual Journalism, Lecturer in Interactive and Motion Graphic.